"creating a world of peace, love and justice, one person at a time." 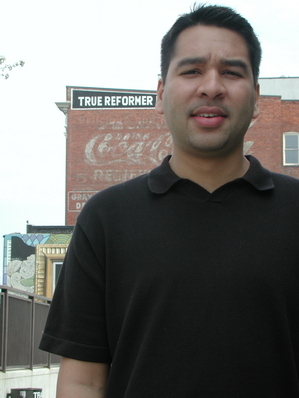 Faisal Alam is a queer-identified Muslim activist of Pakistani descent. At age 19, while trying to reconcile his sexuality with his faith, Faisal organized the first-ever gathering of LGBT Muslims, which led to the founding of Al-Fatiha, an organization for lesbian, gay, bisexual, transgender, intersex & questioning (LGBTIQ) Muslims, and their allies. Since founding Al-Fatiha, Faisal has traveled across the country and around the world to meet with LGBTIQ Muslims to build a global queer Muslim movement. Faisal’s queer Muslim activism has been featured in both LGBT and mainstream newspapers and media. Faisal has received numerous recognitions and awards for his activism on behalf of queer Muslims. Advocate Magazine selected him as an "Innovator," Genre Magazine has recognized him as a "Founding Father," and the Utne Reader chose Faisal as one of 30 "Young Visionaries Under 30." In 2005 the Equality Forum recognized Faisal as one of “40 Heroes” who have "made a defining difference in LGBT civil rights over the last forty years." In 2008 Faisal received an award from Pride Toronto for his "outstanding contribution in the area of spirituality that positively impacts LGBT communities." Video from the 2011 Creating Change conference, where 2,500 LGBT activists and allies came together in Minneapolis, MN. "Practice Spirit, Do Justice" - a plenary featuring Faisal Alam, Bishop Yvette Flunder, Rabbi Joshua Lesser and Rev. Elder Nancy Wilson. Faisal is featured at 23 minutes and 36 minutes into the plenary. The full text of Faisal's comments can be downloaded here.